From the easiest of foolproof cakes, to the crumbliest of pastries and pies, and the most buttery, flaky croissants and danishes All Things Sweet represents years of testing, adapting and refining secret recipes. There's a reason this tiny iconic store in a corner of Sydney is now opening kitchens internationally and that reason is irresistibly delicious baking. 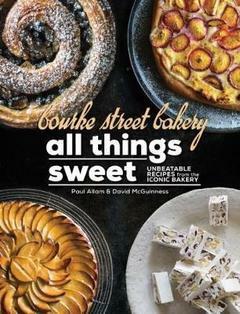 Paul Allam and David McGuinness are the chefs, bakers and co-owners of the wildly popular Bourke Street Bakery empire. They opened the doors of their first bakery cafe in Sydney in 2004 and now have eleven Australian stores and a New York venture underway. Bourke Street is more than just a bakery Paul and David are also founders of The Bread and Butter Project, Australia's first social enterprise artisan bakery, training refugees in baking and pastry-making, and delivering handmade bread to stores around Sydney.